After installing the operating system on each node for the architecture that you choose to deploy, you must configure the network interfaces. We recommend that you disable any automated network management tools and manually edit the appropriate configuration files for your distribution. For more information on how to configure networking on your distribution, see the documentation . All nodes require Internet access for administrative purposes such as package installation, security updates, DNS, and NTP. In most cases, nodes should obtain internet access through the management network interface. To highlight the importance of network separation, the example architectures use private address space for the management network and assume that the physical network infrastructure provides Internet access via NAT or other method. The example architectures use routable IP address space for the provider (external) network and assume that the physical network infrastructure provides direct Internet access. In the provider networks architecture, all instances attach directly to the provider network. In the self-service (private) networks architecture, instances can attach to a self-service or provider network. 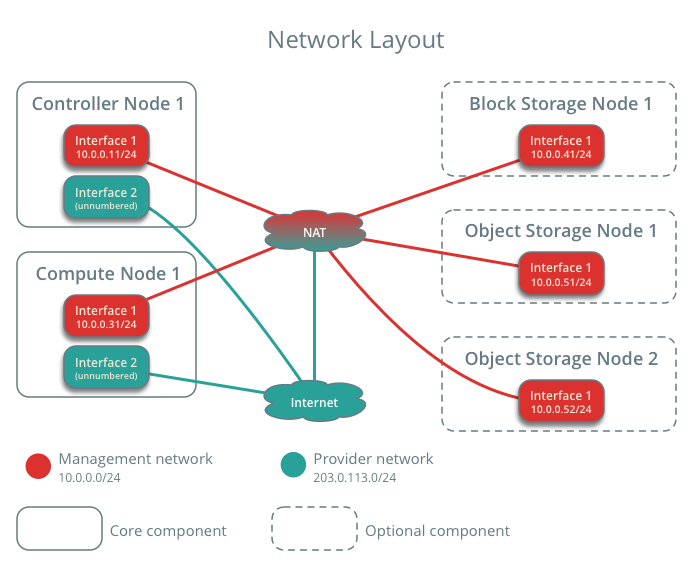 Self-service networks can reside entirely within OpenStack or provide some level of external network access using NAT through the provider network. This network requires a gateway to provide Internet access to all nodes for administrative purposes such as package installation, security updates, DNS, and NTP. This network requires a gateway to provide Internet access to instances in your OpenStack environment. You can modify these ranges and gateways to work with your particular network infrastructure. Network interface names vary by distribution. Traditionally, interfaces use “eth” followed by a sequential number. To cover all variations, this guide simply refers to the first interface as the interface with the lowest number and the second interface as the interface with the highest number. Unless you intend to use the exact configuration provided in this example architecture, you must modify the networks in this procedure to match your environment. Also, each node must resolve the other nodes by name in addition to IP address. For example, the controller name must resolve to 10.0.0.11, the IP address of the management interface on the controller node. Reconfiguring network interfaces will interrupt network connectivity. We recommend using a local terminal session for these procedures. Your distribution enables a restrictive firewall by default. During the installation process, certain steps will fail unless you alter or disable the firewall. For more information about securing your environment, refer to the OpenStack Security Guide.